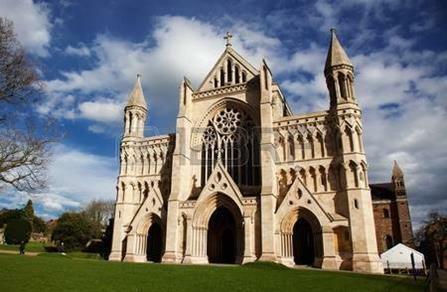 On Saturday 16th September a group of 25 members and guests took part in a tour of St Albans Cathedral. 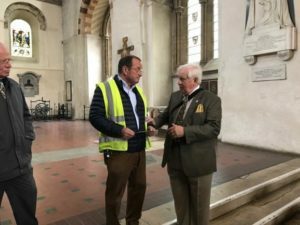 Starting at 11 o’ clock, the tour was given by the very knowledgeable Liveryman George Laverick who is Clerk of Works at St Albans Cathedral. His love for stonemasonry in general and this historic building in particular was apparent to us all and we found ourselves being swept along with his enthusiasm. The view from 144’ up ! His local as well as historical knowledge being second to none, he kept us all enthralled, chuckling along with his witty retorts. 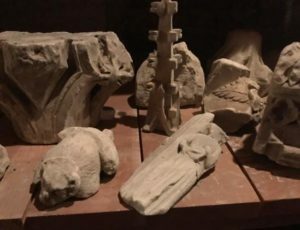 Privileged to have a tour guide of such standing, we had the honour of being taken into the Stone Loft where we viewed the vast collection of carvings held there. From there we continued on our way up the 144’ to the top of the Tower, where the views of the countryside were amazing! After the tour, George accepted a cheque on behalf of the Dean from the Master. The Master presents the cheque. Lunch followed at Brasserie Blanc and everyone enjoyed their meal and thanked the Master for his generosity in supplying the wine. A trip to the local Verulamium Museum proved a perfect way to spend the afternoon. 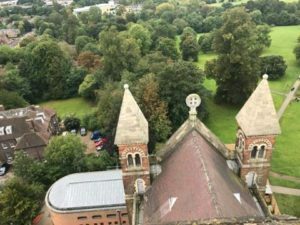 It is worth noting that there will soon be a presentation on Stonemasons to coincide the rebuilding of the Shrine that had been discovered on the site. One to visit in the future perhaps ?